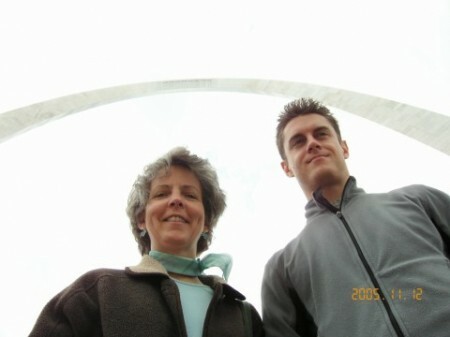 Mom prepared me for the possibility that the Arch may collapse while taking this photo. One of the most endearing, loving, and amusing things my mother does is overprepare me for travel abroad. It all started back in 2001 when I was headed to Kyoto for the year. Concerned about the quality of the water in Japan (a first-world country where people don’t, contrary to popular belief, drink unfiltered toilet water), she packed a special Brita water bottle for me. The water bottle turned out to be handy—not for the filtering mechanism, but as a basic water bottle. In hindsight, I bet I could have drank my own urine out of that water bottle. Not that it ever came to that, but why not? Also before I left for Japan, my mother insisted that I carry my prized possessions (passport, money, stuffed koala bear) around at all times in one of those secret hip pouches that old people wear under their Hawaiian shirts when they travel. Mom had read that it was important to keep those possessions on you at all times. This is actually pretty bad advice when you’re living full time in a first-world country like Japan. Although you need your passport, it’s the last thing you want to lose, so it’s best to keep it in your apartment, not on your person. The advice was particularly amusing and endearing because those money pouches are made for preventing pickpocketing, and there isn’t a country in the world where you’re less likely to be pickpocketed than Japan. People are more likely to slip extra yen into your pocket than pilfer your cash. But at least I was prepared. This entry was posted on Thursday, March 10th, 2011 at 10:18 pm	and is filed under humor, Japan, personal, travel and tagged with humor, personal. You can follow any responses to this entry through the RSS 2.0 feed. Oh, France is a whole different animal. Odd how equally civilized countries can have such a difference when it comes to petty crime. We encountered several young pickpocketers when we were traveling in France. Oh, my gosh. That happened in France!? Well, good to know. I’m so carrying a money pouch around when I’m traveling. Nice post, Jamey. Thumbs up! Go Moms and their advices!! It seemed to me that what was most important was having my money stashed in several places other than my pockets and purse… places that weren’t too handy for thieves to reach. However, I tried not to divide it into so many locations that I would lose track of it. If I were to write a post about your Mom, my first one would be called “A World Beyond Fish Sticks”. Even though I was a picky eater as a child (moreso than today, although some of those preferences persist), your mother always made amazing food and offered it to me. If it weren’t for Margot Stegmaier, I’d probably never have tried fruit cobbler or any type of salad. (Salads look like they would taste like your lawn…so why would anyone have tried to eat that stuff in the first place?) Thanks to your mom, though, my world is a better, healthier place! Thanks Trev for these thoughts. I have always liked having you for a meal. An interesting (and somber) coincidence that you blog about travel to Japan within hours of it being hit by a major earthquake and tsunami. As a former resident, I’m curious to hear of your experiences with earthquake or tsunami preparedness there, since that’s obviously a bigger part of their lives than here in good ol’ MO. Earthquake preparedness I can’t speak of, but I was in an earthquake there a while back. I think it was only a 4 or a 5–it felt like a strong wind was pressing against the house. There was no violent shaking like the videos I’ve seen on CNN today.